Tonight: Mostly cloudy. Lows near 30. Friday: Lots of clouds. Less wind. Low 40s. 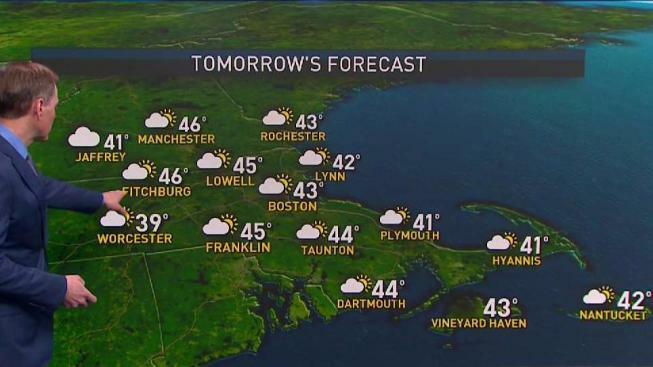 Saturday: Cloudy with a few showers late. Low 40s. As our latest nor’easter pulls away, sunshine and clearing continues to work into parts of Western New England late Thursday and Thursday night. After some melting during the day, expect a re-freeze overnight with lows dropping into the 20s to near 30 for many. That may create a few slick spots early on Friday morning. Otherwise clouds will gradually return Friday, making it a partly to mostly cloudy day with highs again in the 30s and 40s. We can expect more of the same this weekend, as a disturbance drops south out of Canada, keeping us overall mostly cloudy and cool with highs in the 30s and 40s. That disturbance will also trigger some rain and snow showers during the second half of Saturday, and into Sunday as well. That will be more nuisance type activity than anything else. Cool high pressure slides in late day Sunday, into Monday. That brings back more sunshine but it keeps our temperatures below average. During the middle to end of next week we finally have the potential to tap into a wedge of warmth, allowing temperatures to get close to 50 degrees. That will come with more rounds of showers though.